The year ahead: What to expect in Latin America? Economic growth perspectives in the region are quite optimistic: sound macroeconomic fundamentals, growing domestic markets, and structural reforms will further most of Latin American economies in the incoming year. Although we do not foresee a return to pre-crisis growth rates or those at the beginning of the decade in 2010, we expect the region to grow at a faster pace than 2013. 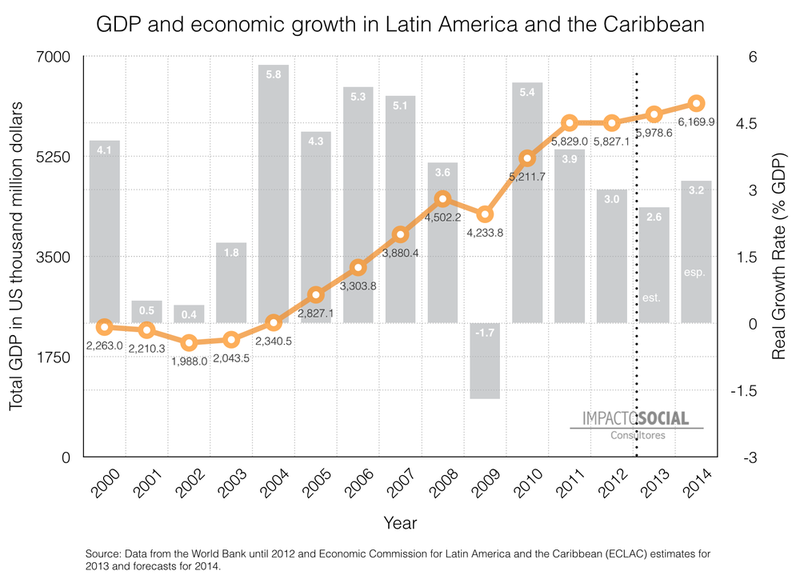 The Economic Commission for Latin America and the Caribbean forecasts a growth rate of 3.2% of the GDP for 2014. This movement will be triggered by the rapid growth of Panama (7%), Peru (5.7%), Bolivia (4.8%), Chile (4.7%) and Colombia (4.5%), as well as a disappointing performance but still improvement in the economic activity of Mexico (3.4%). This year, most Latin American countries will be able to lay the foundations of a sustained and faster economic growth if they make the right policy choices. While strongly linked to the performance of international markets and, particularly, the US economy, the greatest challenge facing economic growth in Latin America remains part of the domestic agenda: implementing structural reforms to strengthening market competition and efficiency, reducing corruption in governments, and ultimately establishing the rule of law. Moreover, Latin American nations will have to meet these challenges while facing a growing and more demanding middle class, as well as a diminishing but still high inequality that keeps being a potential source of social unrest. Chile and Peru, for instance, will face the need of increasing public revenues to meet greater demands for redistributive policies while also experiencing a reduction in economic perspectives due to a moderate fall in the international prices of metals. Argentina and Brazil will have to deal with social tension caused by a poor economic performance in the previous year and a growing discontent with government corruption. Paraguay, being the country with the highest growth rate in 2013 (12.3%), will have a much more moderate performance in 2014 (4.8%) while facing and increasingly violent guerilla movement. Bolivia, Colombia, Ecuador, and Uruguay will sustain growth rates over 4% outperforming the region’s average, while facing stable political and social situation. Finally, Venezuela and Argentina will continue to see a drop in their international reserves, a growing gap between the official and real currency rate of exchange, as well as a sharp rise of inflation. Unlike Argentina, which will still have a positive growth in 2014, this scenario will be particularly challenging to Venezuela, since the country will experience an economic recession (-1.6%) that will reduce the room for economic adjustment. Upcoming presidential elections in Brazil, next October, will hinder a solution of its fiscal imbalances in the short run, since government incentives will lead it to expand social spending without increasing public revenues. Deficit in 2014 is expected to be around 3%, slightly higher than that of 2013. President Dilma Rousseff might be willing to foster reforms to recover investors and international markets confidence, but will only do this once she is reelected. So far, she has a strong chance of retaining office, due to a weak and fragmented opposition, but reelection won’t be a safe game. Criticism against her government can be powerfully reignited in 2014. In 2014, Colombia will have general elections to renew both Congress and the Presidency. However, this process does not suggest any risk for the performance of the economy, not only elections will occur in a stable environment, but also none of the viable alternatives represents an economic threat. Although, President Santos will most likely be reelected in office, the closest runner, Iván Zuluaga and former minister of Finance supported by former President Uribe largely represents continuity to the current economic policies that have driven economic growth in Colombia.